I've been fortunate enough to acquire one of these early and have had a load of fun this afternoon playing about with it. It's designed for live tweaking of the patterns and really works well, especially using 2 synths together and using flipped gates so the synths play off each other when combined with the Patternator. 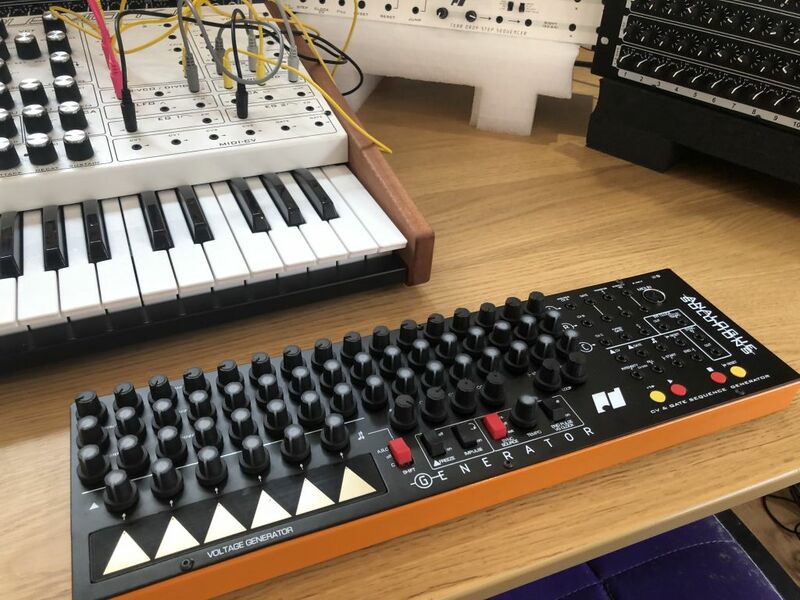 Lots of fun, I've been using it along with the Treadstone, Telemark and Nyborg 24.
i personally think this is one of the more interesting and novel step sequencers i've seen in a while. very unique approach. my only gripe is that i wish there were 3 trig channels, one for each row, instead of just 1 plus the interval generator. 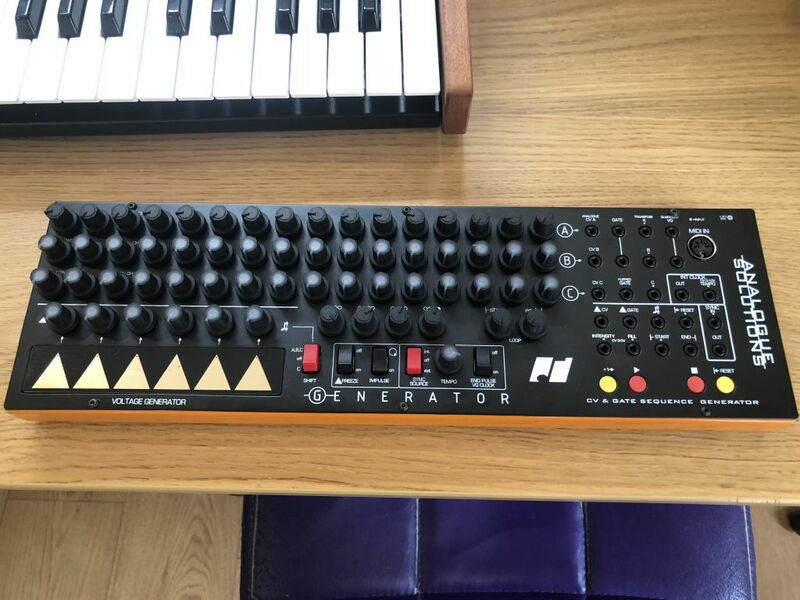 i wish there were more sequencers like this, where you can turn a single knob (or set of 4 knobs in this case) and have it affect the whole pattern-- and then have CV control over that. it seems one could construct some awesome pseudo-generative stuff with this bad boy. Looks pretty interesting. Feels like they've taken some of the ideas developed in Euro sequencers and integrated them into a standalone. Really solid, really nice to use. And lots of cv options. I've currently got it synced to 3 Telemarks a Treadstone and a Nyborg 24. The pattern changes are so easy with the Voltage Generator and patternator. The Generator is sequencing a Treadstone and Nyborg 24 and sending sync to 3x Oberkorns controlling 3x Telemarks. It is really immediate and intuitive to use, definately unique. The flipped gate is currently one of my favourite features for playing off 2 synths against each other. Put together a tutorial of the very basics for connecting to the Generator. Excellent. Nice to see something new from them and not just another repackage. Meh! boring. Tom could never make a sequencer that goes beyond 16 steps. (as in a sequencer with 3 rows of 16 steps). All you get on this one is the same as his oberkorns. 1 row for pitch and the other 2 rows for filter or something else. A short midi sync demo where the sequencer is stopped, started and has the gate pattern changed via midi. The generator is sequencing 2 Nyborg 24's and leads and Arps are from a Fusebox and Telemark Keys modulated by 2 x Oberkorns. This seems to have a great user interface and some cool new features. Btw. You also make amazing sounding insrtuments. The idea behind it is to encourage tweaking and performance with the sequence. It's really quite intuitive to use so you can more or less get up and running right away and get great ideas for tracks. Looks interesting. Although the spacing between the knobs looks a little tight. If you inadvertently bump an adjacent knob does it's value change or is it pretty resistant to small bumps? Fortunately they have enough resistance to survive that, pretty important for when you are tuning without using the quantization as that could get annoying if a knock put the tuning out even a little bit. looks like you have also been fortunate to be supplied with every other bit of AS equipment, you're not a paid shill for Tom are you ? that's about the same size as Dredd's apartment. If you look at my youtube home page you'll see some of my other gear in the pic at the top. 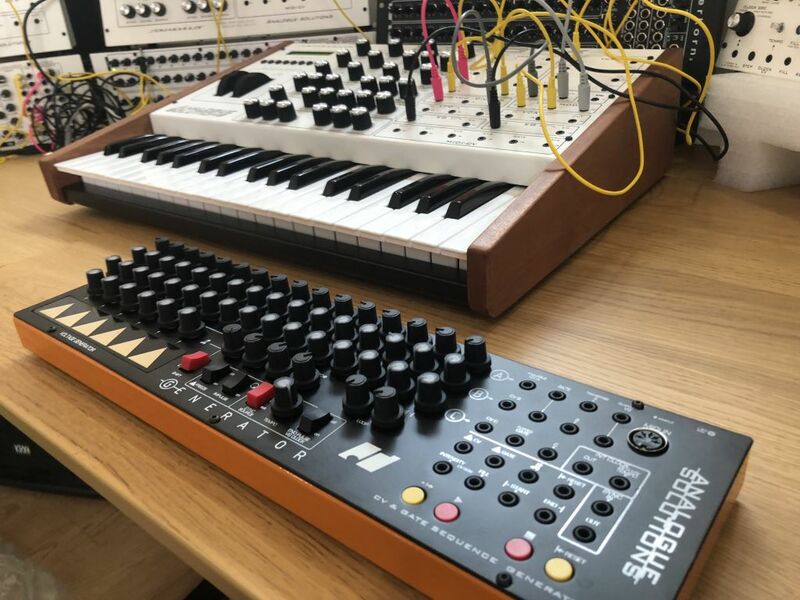 I use loads of stuff though admittedly have enjoyed using a lot of the Analogue solutions gear for the past 6 or 7 months. No harm in that? It has some great ideas put into it and feels nice to use. Really solid bit of kit. I made an 8 step sequence, which is played by 2 synths a Nyborg 24 and Telemark Keys, 1 with flipped gate so it plays the gate when its off for the other synth. I then varied the pattern by adjusting the gate. Kicks is from an Oberkorn syncing a Telemark, additional bass is another Oberkorn sequencing a Telemark. The Generator is Transposing a Nyborg 24. Additonal bass from a Nyborg 24, leads from 2 x Telemark. Clock and Gate signal is from Logic. It is really immediate and intuitive to use, definately unique. "Definitely" has no "A" in it ... just remember that it's core word is "finite". Think of it like "de finite ly" with the word "finite" in the middle and it becomes easier to recall. Yes yes .. I know .. I know .. I'm a picky fekker .. everyone is good at something I suppose.